An organic garden is one which is free from all types of herbicides, pesticides, and fertilizers. 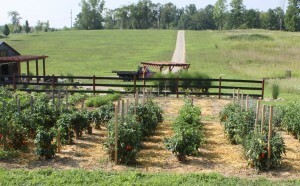 In order to grow plants in an organic garden, people use natural products with no added chemicals. The reason for growing having an organic garden is that it provides fresh fruits and vegetables that don’t contain any harmful ingredients. It can be an enormous task to control the weeds that grow in your garden. Weeds are a common problem in any garden and organic gardens are no exception. In order to cut down on the manual labor involved in weed control is to use vinegar to help get rid of weeds that grow along the rows but not in amongst the food plants. One of the most common natural weed killers is vinegar. In order to use the vinegar, you have to check the forecast. Choose a sunny day without rain in the immediate forecast. Spray white household vinegar on the leaves every 4 to 6 hours. Add a tablespoon of liquid dish detergent to each gallon of vinegar. Vegetable oil can be substituted for the dish detergent. This helps the vinegar stick to the leaves of the weeds. Spray the vinegar solution (don’t dilute with water) directly onto the leaves of the weeds. You can also make an indentation at the root and add the solution with a syringe directly along the root stem. It is important to make sure the vinegar does not get onto other plants as they will die as well. Avoid spraying if there is a wind or even a small breeze.